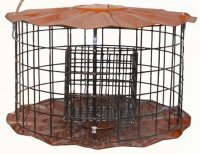 Barrier guarded feeder holds two standard suet cakes and is surrounded by sturdy 16 gauge vinyl coated wire mesh lobster trap material with 1-1/2" openings. Keeps out starlings and squirrels. Top and bottom are powder coated in Erva's exclusive Copper Tint finish. 14" Wide, 8" High. 30055 - Replacement Truss Screw (Starling Proof Feeders) 1 ea.